The powerful European Union trio of Britain, France and Germany has attempted to thwart Iran’s nuclear progress diplomatically. The United States and Israel have threatened pre-emptive strikes against its nuclear sites. Yet still Iran flouts any attempt to nullify its nuclear program. Is this because of a deep-seated disregard for the West or is it due to the ongoing technological and diplomatic support Tehran is receiving from Moscow and Beijing? The answer to this is, probably both. In late November 2004, Tehran made promises to Britain, France and Germany to freeze its uranium enrichment processes, under the threat of potential trade sanctions, and with the promise of compliance bringing the antithesis of such an eventuality. However, Gholam Reza Aghazadeh, Iran’s nuclear chief, has recently authorized the construction of a facility to produce anhydrous hydrogen fluoride, a gas that can be used to produce highly enriched uranium. The plant itself is to be built near the town of Isfahan close to one of Iran’s many (secret) nuclear sites. Although the gas is not classified as a nuclear technology, and thus potentially not a controlled substance, its use to convert uranium tetraflouride to uranium hexaflouride (used in atom bombs) is a contentious point for Foreign Minister Jack Straw of Britain et al., who hammered out the previous agreement with the Islamic Republic. Iran has constantly deployed delaying tactics in recent months, so as to continue its uranium enrichment processes and has pushed the letter of the deal made with the Union trio to the limit. The accord with the Union trio allowed Iran to finish processing some 37 tonnes of “yellowcake” uranium that it had already been using to “test” the conversion facility at Isfahan, and it may do so until February. However, the conversion of this amount can produce enough highly enriched uranium for five nuclear weapons. This does not inspire much western confidence in Tehran, and thus a further showdown looks set to take place in the coming months, but with the presence of a supportive Russia and China, Iran undoubtedly has a few more cards to play. Iran’s relationship with China is currently growing exponentially, due to the communist state’s insatiable energy needs. (According to the Washington Post, China’s energy needs climbed nearly 40 percent in the first few months of 2004). Iran is therefore meeting China’s energy needs in return for access to China’s large scale and low-cost manufacturing industry, as well as the obligatory support for nuclear co-operation. China is currently Iran’s second largest export partner and third largest import partner, and with the contracts that are currently on the table, these positions are soon to be bettered. In July 2004, Iranian parliamentary speaker Gholam-Ali Haddad Adel was very complimentary of the Sino-Iranian relationship. In particular, he highlighted China’s support for Iran’s nuclear programs. This aside, Iran also has unfettered access to the improving technology being developed and utilised by the People's Liberation Army of China. According to the International Atomic Energy Agency, China has probably provided nuclear technology to Iran. This fact, coupled with Washington’s need to pressure China not to sell large quantities of anhydrous hydrogen fluoride to Iran in 2000, and rumours that Beijing may have also sold a blueprint for a facility to produce highly enriched uranium to Iran as part of the same deal, raises questions about the Sino-Iranian relationship and the possible future ramifications of continuing nuclear co-operation between China and Iran. China’s nuclear support for Iran may be a well-known secret. Russia’s transferral of nuclear technology to Iran, however, is no secret. It is well known, continuous and above all, increasing. The Iranian nuclear plant at Bushehr is being built by the Russian company Atomstroiexport (Russia’s sole exporter of nuclear technology), a company which recently sold a controlling stake to Gazprombank, a subsidiary of the giant state owned gas company, Gazprom. The chairman of Gazprom, Dmitry Medvedev, also happens to be chief of staff for President Vladimir V. Putin of Russia. Russia’s leaders also have their fingers in other Tehran pies. TVEL, Russia’s sole nuclear trader, which according to Interfax, recently appointed a close aide of Putin’s as its new chairman, is about to agree a deal with Tehran that would supply nuclear fuel to the Bushehr reactor. Russia, unlike China, could be seen as being quite open in its dealings with Iran. 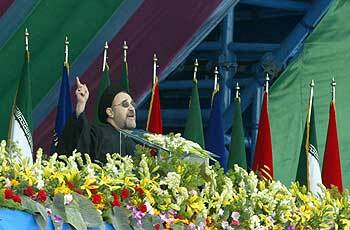 Although President Mohammad Khatami of Iran recently applauded the relationship between Moscow and Tehran with regard to nuclear energy, calling it “…positive,” Russia is remaining steadfast in its position that, as Iran is part of the nuclear non-proliferation treaty, it has every right to pursue nuclear energy for peaceful means. This is fair and true, however, some believe that some of the more benign nuclear exports to Iran have dual-usage. With Iran’s nuclear pursuit, Russia is not fairing too badly economically. The Bushehr plant brought in $800 million from the Iranians and a contract for a further seven generating units is being planned. A deal that could be worth up to $10 billion to the Russians is a deal that cannot be refused easily even under pressure from Washington. The Chinese have reasons for their pro Iranian stance other than the import of Iranian energy. Politically, they are not pro the westernisation of the Middle East. Diplomatically they are not friends with Iran’s enemies. They have an aggressive stance with the United States regarding Taiwan and they are not best of friends with Israel, which welched on defense contracts. In fact, December saw a large deterioration in diplomatic relations between China and Israel that culminated in China’s deputy prime minister, Tang Jiaxuan, flying to Jerusalem to demand the immediate return of an unspecified number of Israeli-built Harpy unmanned aerial attack vehicles that were sent back to Israel for upgrading, and that have since been confiscated by the Israelis under pressure from Washington. The deputy prime minister even suggested that this episode could prove disastrous for Israeli firms operating in China (including Hong Kong). It is probable that no small amount of pressure from the United States will be sufficient to sway China away from continuing its nuclear co-operation with Iran. Russia as well may be difficult to dissuade. During a press conference in October 2004, Russia’s foreign minister, Sergey V. Lavrov, stated that Russia does not support the idea of referring Iran to the United Nations for sanctions and will continue nuclear co-operation with Iran. Moscow has been seen to pressure Iran on its nuclear activities; however, Britian and the United States see Russia’s pressure as somewhat aesthetic rather than for a means to a peaceful end. Why is Russia aiding Iran in achieving its nuclear ambitions? There is the obvious answer that such hugely beneficial contracts aid the Russian economy. But there must be another reason. Is it geopolitical? Would a westernised Iran be detrimental to the Russians? Could a pro West Iranian government drag other Middle East countries towards the West? Either way the push for a pro West and “democratised” Middle East is not in either Russia’s or China’s best interests. By acting as a bulwark in Iran’s nuclear development, these two powerful states could be seen to be creating a buffer to the United States’ aspirations in the region.